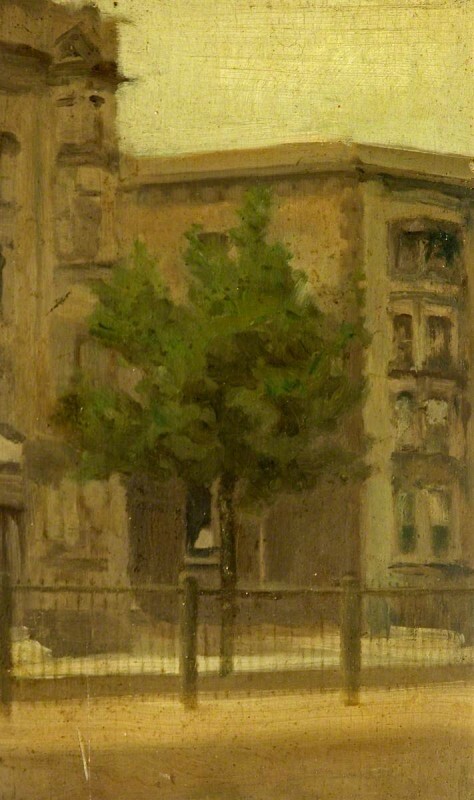 Art Detective user Martin Hopkinson questioned the true location of Paul Fordyce Maitland’s, ‘A Plane Tree, Cheyne Walk’, as he found that the buildings depicted in the painting did not appear in most nineteenth and twentieth-century records of the area. Contributor Andrew Chamberlain proposed that the building could have been St Mary Abbott’s in Kensington, which had been demolished. Osmund Bullock also thought that it was probably not Cheyne Walk, whilst also pointing out the frequent appearance of plane trees in Maitland’s paintings. Kenneth McConkey, Art Detective Group Leader of the British 20th C, except portraits group, added that in the 1994 Fine Art Society Maitland exhibition, one of the pieces appeared to be the same view, with a large plane tree that was probably the same tree that had grown larger. He also pointed out that Maitland often returned to favourite spots and that the 'church' begins to appear in later works more like a ‘tall apartment building with bay windows’. The discussion was then continued by Malcolm Fowles, who noted that on an 1895 map there were no narrow alleyways between the blocks of Cheyne Walk and the railings continued around the corner, signifying a road. Art Detective user Chris Pain was able to develop Fowles’ proposal by suggesting that the location could possibly be at the bottom of Blantyre or Luna Street. 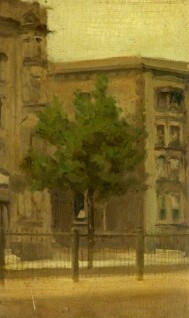 He noted the similarity with the location in Maitland’s Cheyne Walk in Sunshine and with the railings and trees in a Cheyne view by nineteenth-century painter Fairlie Harmar. Andrew Greg, Art Detective Group Leader for British 19th C, except portraits, supported this by providing photographs of Luna Street before it was destroyed. Malcolm Fowles then responded that Maitland possibly painted this piece at the Kensington Vestry Wharf, which he concluded to have been a ‘great place to paint’. Although the location of Maitland’s piece had been confirmed, Richard Green, Art Detective Group Leader for Yorkshire and the Humber, questioned the attribution to Maitland, suggesting that it could be the work of an imitator. Green then concluded that although the quality of Maitland’s work was somewhat uneven, this picture could not be securely regarded as being by his hand. Andrew Greg concluded the discussion by formally recommending an attribution to the ‘circle of Paul Maitland’ and confirming that the location is the junction between Cheyne Walk and Luna Street. Art UK’s database has been updated accordingly. Does this work by Paul Fordyce Maitland depict a street in Chelsea or Kensington?